CS-Cart "Table of options" add-on is a good contribution to wholesale stores. 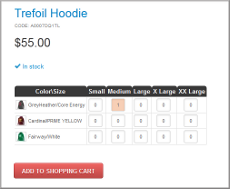 It displays product options in a table form on a product details page (for example, color and size table). Customers will be able to choose the quantity of necessary items which they would like to buy for every option and get a subtotal price. the ability to set the limits on height and width of the table of options when the scroll bar appears. The add-on is compatible with CS-Cart v. 3.0.x - all 4.х.х versions. 1. We offer free installation of this add-on for the default CS-Cart versions (that don't have any file changes and additional modules). Otherwise, the installation may require the additional charge. How to create a table of options? 1. After the add-on installation go to Products -> Products -> click the necessary product. 2. On product editing page click "Options" tab and create a necessary option or options (for example Color and Size) or add global options if they are already created. None - default value. Option will not be included in a table. 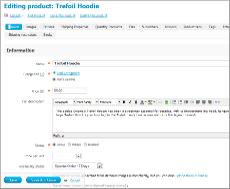 Table rows - option will appear on product details page as a table row. 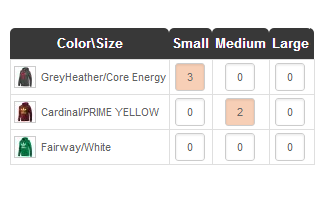 Table columns - option will appear on product details page as a table column. 4. If necessary, you can add images for option variants (default CS-Cart functionality). These images will appear in a table in a corresponding row or column. 6. Repeat the steps 2-5 for the second option that will be included in a table. 7. Click "Preview" to see how a created product options table looks like in the storefront. 1. Download the archive with the Table of options add-on. Add-ons -> Manage add-ons (CS-Cart v.4). 4. In the list of add-ons find the Table of options add-on and click Install opposite to its name. Watch the video How to work with the module "Table of Options". It is better to contact us via manager@alt-team.com! The client manager will give you the detailed answer how to make the demanded feature for free or the price for the additional customization. It is compatible with Cs-Cart 4.2. "IS IT COMPATIBLE WITH CSCART 4.2?" "Yes, it is compatible with cs-cart 4.1.5." "Is it compatible with cs-cart 4.1.5 ?" "Great Addon, works a treat. thanks"